If you’re not using video as a content marketing tool, you’re losing out. In a recent study by Cisco, it was estimated that global internet traffic from videos will constitute 80% of all internet traffic by 2019. With the widespread adoption of high-speed internet (and in recent years, mobile internet), people can finally fulfill their desire for vibrant, stimulating visual content whenever and wherever they are. When you consider that 6 out of 10 people prefer online video streaming to live TV and that 300 hours of content are uploaded to YouTube every minute, it’s clear that YouTube is the perfect platform for brands to communicate with their audiences. As with all types of content marketing, one of the biggest challenges in producing videos is selecting topics that people are genuinely interested in. It can take hours or even days to create a high quality video. But if the topic isn’t something that people care about, don’t expect to get any views. Instead of using the “post and pray” approach to video production, it’s far more effective to research what kinds of things people are actually looking for, and then seek to fulfill their demands. You can accomplish this by using a selection of YouTube keyword research tactics. For maximum engagement, it’s crucial to find keywords that people are searching for on YouTube, but also on Google. The best place to start performing keyword research is within YouTube itself. When you type in search terms related to your niche, you’ll receive a selection of suggested results. This feature was designed to help users find content which relates to their interests, but it can also be leveraged by marketers as a keyword research device. For further options, enter your keyword followed by each letter of the alphabet and see what kinds of results show up. At this stage, you may wish to start recording your findings on a spreadsheet. Because you can’t receive extended data (such as search volume) about the keywords, it’s not wise to make your decisions solely based on YouTube’s autocomplete options. However, you can get some great insights before moving onto other tools. Make sure to also check if the keyword ideas you gather are relevant for your video content and if the searcher intent reflected by these terms matches your needs. For this, it’s always helpful to look at the top 10 or 20 results YouTube returns for these keywords, and figure out if your content would be a good addition to the SERP or not. This check up can be simplified using a rank tracker like AWR that automatically pulls the lists of sites ranking in YouTube for all targeted keywords and gives you quick access to the SERPs. In order to determine what types of videos are ranking well in your niche, check out your competitors. You can find your competitors fast with AWR by simply entering the set of keywords you’re targeting for YouTube into the app and it gives you the list of top videos or YouTube channels that rank best and get the most traffic. Further on, once you have decided wich are the most important competitors for you, you can track their evolution in YouTube searches regularly and compare it with your own. You can track up to 50 YouTube competitors in Advanced Web Ranking, per project, with no impact on your monthly subscription price. With the free Chrome tool, Tags for YouTube, you can easily analyze the titles and meta tags used by your competitors. You can learn more about these keywords once you enter them into some of the other tools shown below. YouTube’s own keyword research tool became obsolete in 2014. The company recommends moving over to AdWords for keyword research – so this is the next place you should visit. Although you have to sign up to AdWords in order to do keyword research, it’s free and takes very little time. You can click here to get started. In the “ads formats and sizes” tab, make sure that “video” is the only format checked. Next, run the keywords you found on YouTube through this tool and see what kind of results you get. Adwords Keyword Planner is extremely helpful because it displays the search volume for specific keywords. Obviously you’ll want to utilize the keywords that are receiving the most searches. You can also input the URL of other high ranking videos into Keyword Planner and see what keywords come up. These results will give you excellent insights into how to rank well for your niche. For more unconventional and smart ways to use the AdWords Keyword Planner, check out this post from Dan Shure. If you’re just starting out with YouTube videos, Keyword Tool Dominator is a great resource. It allows you to input 3 seed keywords per day for free, generate a list of relevant keywords and download the ones that are most useful as a .CSV file. For unlimited daily searches and to view keywords in order of search volume, you can subscribe to the YouTube edition of Keyword Tool Dominator for a one-time fee of $39.99 USD. There are more comprehensive (and expensive) keyword research tools available, but if you’re a beginner – this is an excellent starting place. Google Trends has long been one of the most popular research tools for marketers. Fortunately, this tool allows you to look at search queries which specifically pertain to YouTube. Select this option under the “Web Search” tab, enter your keyword and voila! You’ll receive some excellent insights into the rising or falling popularity of your search term. When analyzing related queries, ensure you don’t blindly use keywords that have no relevance to your niche. 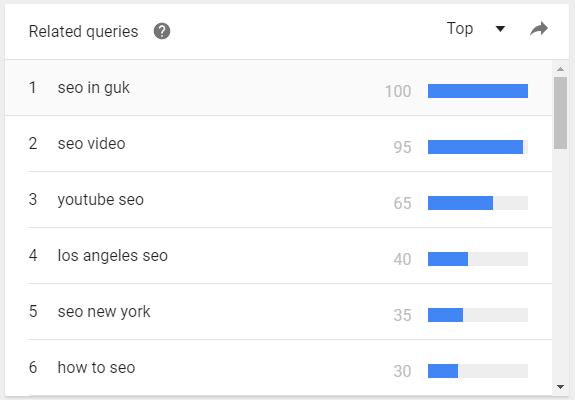 For instance, when looking for queries relevant to SEO, it’s important to note that Korean performing artist, Seo In Guk, has absolutely nothing to do with search engine optimization. If you have a brick and mortar store or your content pertains to a specific country, Google Trends allows you to generate results by location. Simply click the “Worldwide” tab and scroll down until you find your desired country. If you’re marketing to more economically developed countries or just to English-speaking countries, it’s useful to play around with this feature and also check out the “Interest by Region” tab. It’s important that your keywords are applicable to your target demographic and not people from nations who aren’t interested in buying from you. Conversely, you may discover entirely untapped markets that you wouldn’t have expected to have an interest in your products and services. This is why Google Trends is such a powerful research tool. Keyword Keg is one of the most comprehensive research tools on the internet. It allows you to filter your data by YouTube searches. In order to get highly specific results, you can also filter by language and by country. With this tool, you can learn about each keyword’s search volume, keyword power, world value and world cost per click. The only downside to this tool is that if you want to see all the data pertaining to each seed keyword, you have to pay. Depending on how much information you want access to, you’ll pay anywhere from $8 to $24 USD per month in order to use the Keyword Keg service. Fortunately, there is a 30 day money back guarantee, so if you sign up and don’t consider it to be a worthy investment, you can cancel your membership with no loss. If you’re serious about generating engagement for your YouTube videos, I believe you’ll find Keyword Keg to be a worthy investment. If YouTube plays a significant role in your company’s marketing strategy (i.e. the people who watch your videos are consistently converting into paying customers), consider subscribing to Keyword Tool. Of the tool’s many data insights, the ability to filter using buyer intent is particularly useful. With this functionality, you can hone in on keywords that lead to conversions instead of just views. Depending on what functionalities you require, you’ll pay anywhere from $48 to $88 USD per month for a subscription to this service. With the free version of the tool, you’ll receive a huge list of results per search (pulled from YouTube Autocomplete and Google). However, in order to know how valuable each keyword will be for your campaign, you’ll have to subscribe to one of the paid packages. All pricing packages allow you to export your data to a .CSV file. If you want to view keyword search volumes and find out the AdWords competition or CPC for your keywords, you’ll need to go with the Pro Plus package at $88 USD per month. You’ll definitely receive excellent keyword insights with this tool, but if your budget is low or you’re just getting started with YouTube, it’s better to start with cheaper or free tools. If YouTube is your only or most dominant channel for bringing leads to your website, consider using YTCockpit. Unlike other software packages which can be used for a variety of SEO applications, YTCockpit is completely focused on YouTube. Because the tool is so specifically targeted, its functionalities are unrivaled for video marketers. YTCockpit will deliver keyword ideas based on data from YouTube Autocomplete, Google AdWords and Google Suggest. However, you’ll also receive intel about the likes, subscribers, video lengths and video qualities pertaining to your search results. This tool is excellent for performing competitor research and you can also see the traffic trends for each keyword. Depending on the package you want, prices range between $19 to $99 USD per month (you will receive a discount if paying for a year in advance). If you’re just getting started with YouTube and want to perform basic keyword research, I would explore free options such as YouTube Autocomplete, Google Trends and AdWords Keyword Planner. If you’re already up and running and want to maximize the impact of your video marketing campaign, I would suggest looking into more premium tools, such as Keyword Tool and YTCockpit. Whichever path you choose, know that when you consistently integrate researched keywords in your YouTube uploads – you’re already ahead of the majority of publishers who are using the haphazard “post and pray” approach to YouTube video optimization. Can you think of any other methods for performing YouTube keyword research? Please let me know in the comments below. Extremely helpful article thanks, I had no idea some of these options existed and have been marketing on Youtube for years for Uscenes and other brands. I am going to start with the Tags for Youtube tool, then Youtube Cockpit. Hi Mat – Glad you found the article useful. Best of luck with your new tools! I’m sure you’ll see a big improvement. Worth a read! I’m using SE Ranking to get the keywords for my videos – it’s pretty easy and top-notch accurate. Nevertheless, I’ll definitely try all the mentioned methods. Thanks a lot!